It is hard to believe that this time last year I was deeply immersed in preparing for Oktoberfest in Munich. (And by preparing I mean scouring the Internet for the perfect dirndl and drinking a lot of beer.) It is even harder to believe that I am going back again this year! It is not all dirndls and liters of beer though – there is so much more to Munich. Reading this site you might think all I do is drink and eat (and you would be pretty much right). But when traveling I do partake in some activities to immerse myself in the culture and maybe even learn a little something. Here were a few of my favorite sites and things to do in Munich. Owning a BMW might not be in my future, but it doesn’t mean I can’t appreciate looking at them. The BMW exhibition possesses that cool factor – from the design of the building to the collection of cars, which range from old to new. The inside looks like an actual highway, and people zip around in the latest from BMW. The customer experience exhibition also includes interactive games that are fun for children or adults who like to act like children. 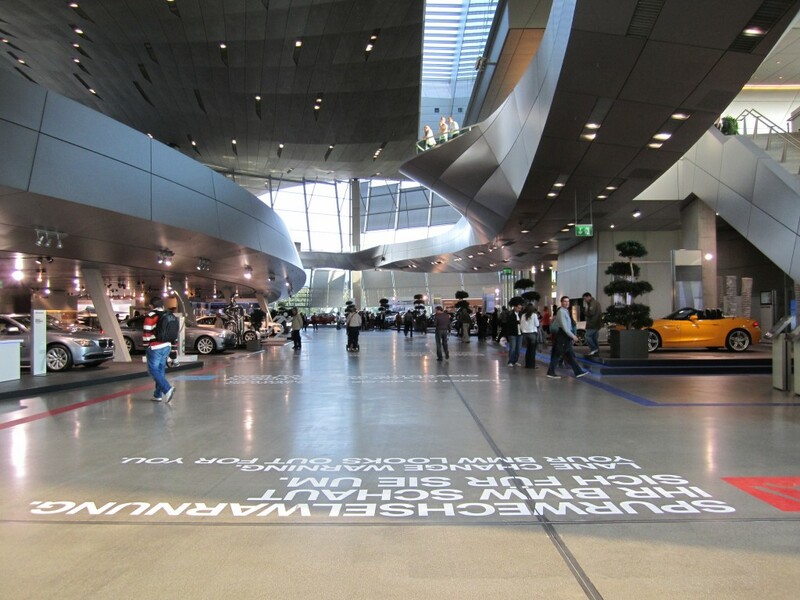 There is also the BMW museum, which is a piece of automotive history with around 125 exhibits. Previous exhibitions have featured art cars from greats like Andy Warhol, Frank Stella and Roy Lichtenstein. We didn’t make it through the museum, because we were directionally challenged that day and it seemed to take us forever to get to the location. Perhaps a return visit in September will be in order! If you are like me then you just cannot get enough of the Olympics right now. I am not saying that I rush home every day so that I don’t miss a minute of the events, or cry when someone wins a medal…that would just be weird. 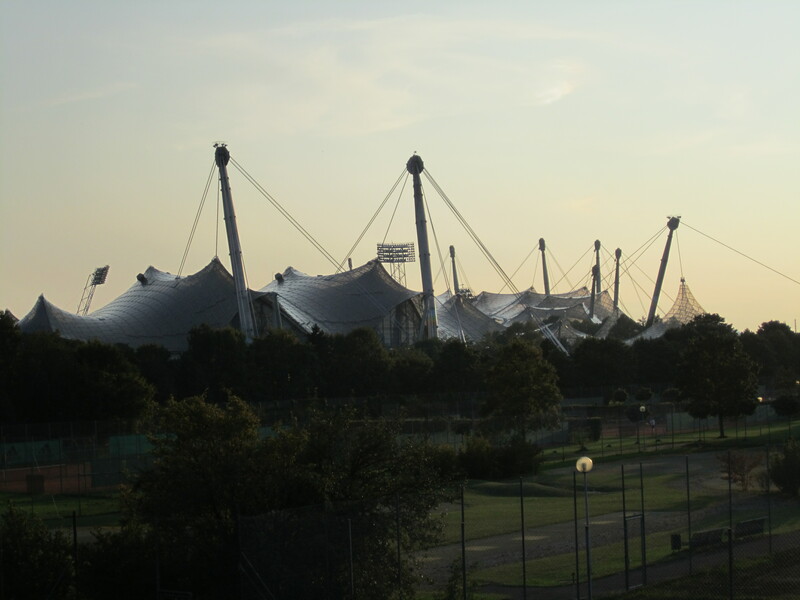 I am never going to win an medal, but visiting Munich I knew I couldn’t miss out on the chance to see Olympiapark where the 1972 Summer Games were held. Olympiastadion is truly stunning and architecturally unique. The large canopies look like modern, sleeker circus tents, which are made from acrylic glass and steel cables. Tours are available, but we just strolled around at our own pace. But the 1972 Olympics in Munich will forever have a black cloud cast upon it after 11 Israeli athletes were taken as hostages and later killed. While the memorial site is solemn, it is an important part of history that is worth visiting. Maximilianstraße is one of the four royal avenues, and it attracts the rich and the people who just like to look at expensive things. Home to many of the most famous (and expensive) brands – like Chanel, Escada and Dior – it is the best window shopping around. But more than just looking at expensive items I cannot afford, I just enjoyed the atmosphere and taking a leisurely walk down this avenue that possesses some beautiful architecture. Munich is a very clean city, but Maximilianstraße absolutely sparkles. Whether your shopping budget is big or small it is a great place to spend an afternoon. Marienplatz is at the city center and is where all the action is at, and every day people gather here to watch the figurines of the Rathaus-Glockenspiel come to life. The 43 bells and 32 life-sized figures tell two stories of Munich’s history – the marriage of Bavarian Duke Wilhelm and the Cooper’s Dance, which signaled the end of the plague in 1517. There is nothing that says merriment like the end of a plague. 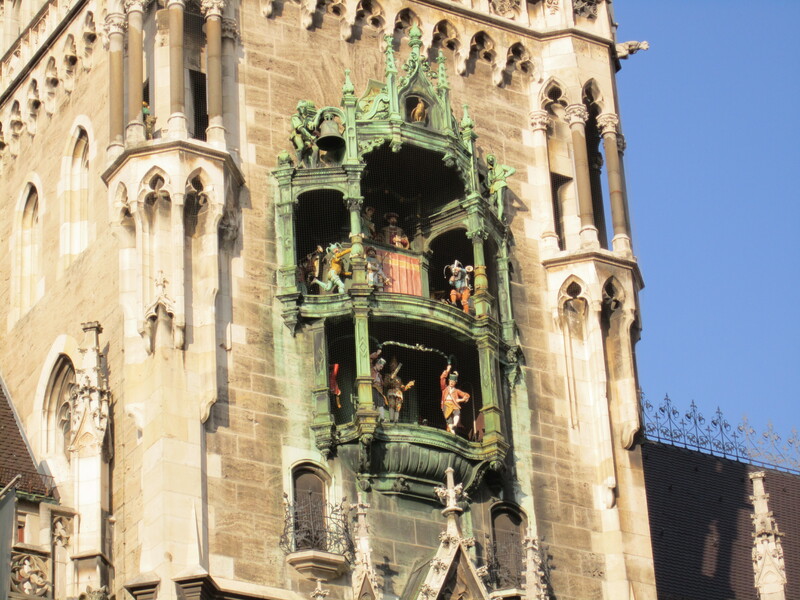 And what better way to spend an afternoon than with a beer in hand watching the Rathaus-Glockenspiel.